I’ve been kicking around ideas for an interior table setup for Infinity for several months now – that is, a table that instead of being buildings and regular terrain, is entirely or mostly the interior of some large structure. A big starship or space station setup was an obvious choice, especially as the faction I run in Infinity, Haqqislam, is described as the premiere merchant marine power with a very strong space presence throughout the Human Sphere. The idea percolated in the back of my head for ages, a few planning sketches were made, but no actual concrete work was started until Captain Spud posted his spectacular Yu Jing “Space Truck” transport starship (Infinity forum thread here, Youtube video tour here) and his link to the really cool Creative Commons-licenced science fiction textures from Philip Klevestav that he posted as part of his online portfolio. 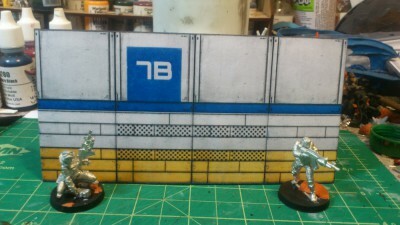 I had already planned on doing the station walls & bulkheads in mattboard, my usual building material, but finding those textures and realizing how easy they would be to modify and change has actually prompted me to get started in GIMP on creating wall panels and other graphics. First panel, a 6″ wide by 3″ high bulkhead, with two Haqqislam troopers propping it up. Click for larger, as usual. I’ve created a multi-layer GIMP image that should make it easy to create lots of variations and slightly different wall layouts for different areas of the space station. The basic module above is 6″ long and 3″ wide; I’m going to use a 3″x3″ module as standard, expanded to a 3x3x3 cube if required, with 6″ and 12″ long wall segments for the most part, with some 9″ and 3″ long pieces just to break things up a bit. These are the same dimensions as the Objective Room I built for Infinity earlier this year, which wound up with a total footprint of 9″x9″ and 3″ tall. I’ll also do some 6″ high units, especially for very large cargo doors and the walls of cargo areas, hangars, and similar large spaces. Most of them will likely have catwalks partway up the walls, just to add a bit more of the 3rd dimension back into the playable parts of the scenery. More as this project progresses, and eventually I’ll figure out how to share some of my images, although the working GIMP file is already 7.8Mb and growing! Previous PostBlood Bowl Sideline Ads, Sheet The FirstNext PostA Christmas Tree? Awesome! Looking forward to seeing more!